I love it when there’s a tool that solves a sewing challenge. That’s just what Foot #38 does. Officially called the Piping Foot, I think of it as the “uneven foot.” It makes it easy to sew in situations where the foot needs to ride along an uneven surface with one side of the foot on a thick area and one on a thin one. 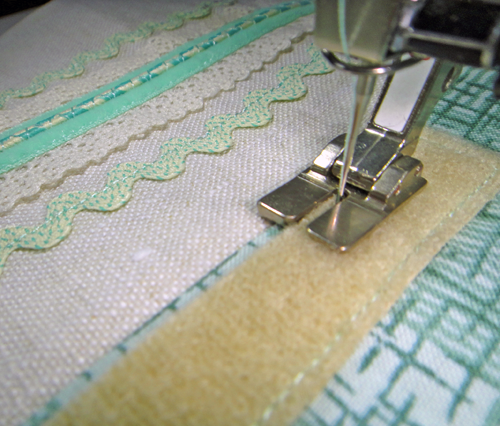 This could be along thick seam allowances, sewing on trims or attaching hook-and-loop tape. An all-purpose foot “wobbles” as it tries to navigate such lopsided terrain, but with Piping Foot #38 it’s not a problem. If you take a look at the sole, you’ll see that one toe is thicker than the other. Simply place the thin toe over the thick surface and the thick toe on the thin surface, evening things out and keeping the fool level. The one thing to remember about Foot #38 is that it works with a straight stitch in center needle position only – don’t zigzag! The “uneven foot” is good for seaming, topstitching, and edgestitching anytime you need to even things out. Previous Previous post: WeAllSew Celebrates Our Loyal Fans: 65,000 Likes!